2018. By Erin Paul Donovan. A new photo history of James Everell's Henry's East Branch and Lincokn Railroad, the largest logging railroad operation in New England history. 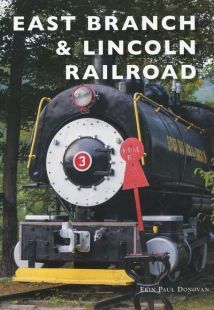 Book features dozens of historic images of this Lincoln, New Hampshire-based railroad, along with many modern day color images of remaining artifacts found scattered throughout the local region. A must have book for history buffs and backwoods explorers alike. Softcpover. 96 pp.